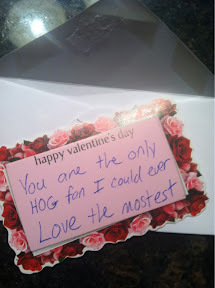 I had a very unexpected Valentine’s day! It started when Tyler got me these flowers! He has only bought me flowers one other time in our 5+ years together (on my birthday last year)…so I was SHOCKED to get these. SO beautiful and thoughtful! He also got me THE CUTEST Razorback shirt. 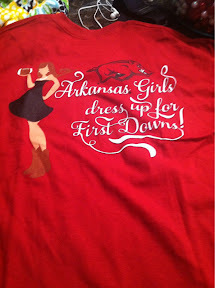 It says “Arkansas girls dress up for first downs” and the little girl has on a black dress with cowboy boots, holding a football. Love it! We were going to wait until Friday night to go out (I had Zumba/restaurants are packed/we would have rather gone out not on a work night)….but Tyler ended up working late. I stayed in town to help him as much as I could….so we were HUNGRY when he finished at 7:30. Even though I had dinner waiting in the fridge at home, we decided to go out. We tried a new Mexican place here in Fort Smith- Patron (it’s on Towson in the old Shoney’s in front of the Phoenix Expo). And if you are from around here….you gotta go! It was SO good! 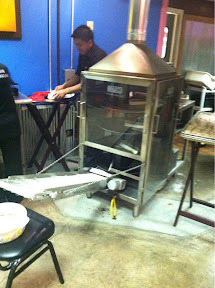 When you walk in the door, you smell fresh tortillas…and that is because they are making them right there! In this funky little contraption! Fresh corn and flour…and we tried them both. SO good. 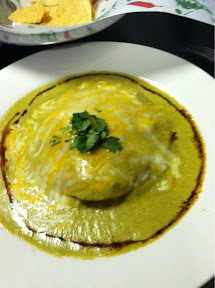 Tyler had fajitas (they were yummy), but the stars were the salsa, queso….and this Mexican Lasagna. Oh. My. Goodness. I had planned on eating half of this…but I ate the whole thing (oops…and I just posted about dieting yesterday! ha! Oh well, it was my cheat meal for the week!). It was chicken, chorizo, cheeses, and this DELICIOUS sauce. So stinking good. We came home and watched Suits (our favorite show at the moment)….and crashed. We had a Patron in Fayeyteville. It was our favorite! It shut down unexpectedly. I thought I remembered one there…I wonder what happened? Well, come on down if you want to eat it! Hallelujah for salsa and Mexican food! Ha! Your honey is so sweet!!! The flowers, card and tshirt are awesome! 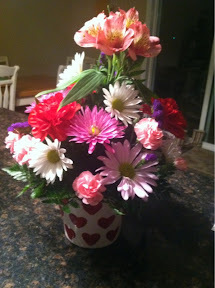 I actually cooked our Valentine’s dinner and we stayed home this year, and I loved it! It was a nice change from a crowded restaurant! Yes! We usually stay home, so going out was a nice change! He knows chips and salsa are my love language.